SATAN CAUGHT ON FILM? RARE PHOTO OF LUCIFER? On Oct 29, 2004, two days before Halloween, we took some photos of The Lunar Eclipse using a a Kodak disposable camera. We were standing outside of our home (in white). There were no clouds in the sky, we nor our neighbors have a fireplace and the chimney (heat) was not on. We took a total of twenty four photos. When they were developed, 23 photos contained a completely clear sky. 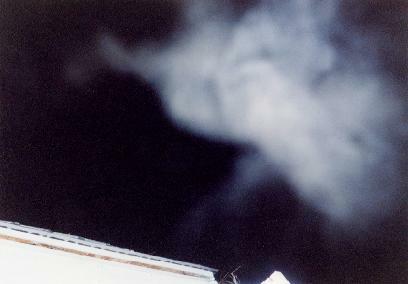 One photo alone shows this ghastly and ghostly image (shown above). THE DEVIL CAUGHT ON FILM? TAKE A GOOD LOOK AT THIS HORNED IMAGE. LOOK AT THE PERFECT SYMMETRY IN THE FACIAL FEATURES. HOW CAN THIS JUST APPEAR? THIS PHOTO IMAGE BEARS A STARTLING LIKENESS TO THE ANCIENT STATUES OF PAZUZU, THE SUMERIAN VERSION OF "THE DEVIL" AS SHOWN IN THE 1973 MOVIE, "THE EXORCIST." Notice the similarities between the Face in the Photo and The Statue of Pazuzu. Notice the "V" shaped Brow, The Triangular Eyes, and the horns although Pazuzu is shown with closed horns. Did the ancient Sumerians see Pazuzu (Satan) as we did in the Photo taken over our home, then create a stone statue? a monument to this ancient evil? Maybe because I teach The Truth of The Gospel and expose the lies of his TV Preachers, I got Satan so angry he decided to pay us a visit? Whatever that image is, GOD allowed us to see it, caught on tape, hovering over our house! Perhaps GOD wants us all to see Evil "face to face" so we have a visual image of WHO our true enemy is? This photo keeps me in prayer, that is for sure. BUT DELIVER US FROM EVIL". fn: In The Gospels, Jesus refers to Satan as the "god of this world". The Apostle Paul, in his letters, calls Satan the "god of the air", The Atmosphere.